The Dirga Pranayama, or complete breath, has three parts. It is useful in chest opening exercises, forward-bending exercises and belly-down postures that allow you to focus on breathing. For this type of breath, you inhale through your nose, filling your belly first. Then, you fill your chest, and finally your lower neck. Then you exhale, starting from your lower neck, then out of your chest and finally your belly. This style of breath will relax you, making it ideal for more passive flows. To get instant feedback on your form, you can put one hand on your stomach and one on your chest. When you inhale into or exhale from your chest or stomach, your hand should rise or fall accordingly. This gives you a sense for how you're doing in the breathing exercise. 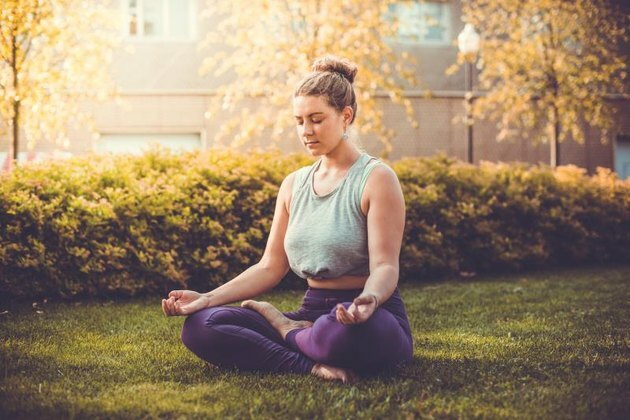 Ujjayi Pranayama, or warrior's breath, is a more powerful form of breathing that is better suited for a stronger practice or flow, like a vinyasa or Ashtanga class. You breath in and out through your nose. While exhaling, you want to push the air up through the back of your throat, making an "h" sound — but keep the lips sealed. This forced exhale activates your ab muscles slightly more than normal, which is why it is used more in strong practices to build heat. Start by practicing this breathing exercise for 5 to 8 minutes at a time. Eventually, you should progress to doing the exercise for 10 to 15 minutes at a time. You can practice it sitting, while holding a pose or lying down in Savasana. Bhramari Pranayama is appropriately named "bee breath" because it involves making a humming sound. You can practice this breath either sitting or lying down. To start, put the tips of your index fingers in the soft space between your ears and your cheeks, otherwise known as your temples. If you are lying down, don't press your fingers against your head, just let your arms hang by your side. Breathe in through your nose and, as you breathe out, make a humming sound and gently push your index fingers in. The humming sound is relaxing, making this breath useful if you're having trouble concentrating while in yoga class. Kapalabhatti Pranayama is also known as "the skull shining breath." The focus of this breath is on the exhale, which is short and forceful. You are trying to push the air out of your belly as fast as possible by contracting your abs. Once you force the breath out, simply let the inhale happen without any effort. Both the inhales and the exhales move through your nostrils, not your mouth. This is a short, quick style of breathing, which means that it can give you energy. Use this breath if you are preparing to meditate or to clear your mind before an active practice. The goal of this breathing exercise is to breathe through one nostril at a time. It's best to do this exercise in a seated, cross-legged posture. With your right hand, lightly press the tips of your index and middle finger of your forehead, the tips of your ring finger and pinky finger on the left nostril, and the tip of your thumb over your right nostril. Close the left nostril with your ring and pinky finger and exhale through the right nostril. Then breathe in through the right nostril, close it with your thumb, and exhale through the left nostril. Continue to alternate sides until you've done ten breaths with each nostril.